Well the good people out of 2K Games and Gearbox have announced Borderlands 2. The game is currently in development and is set for an April 2012 release. 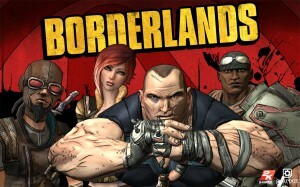 Borderlands 2 will feature new characters, weapons, equipment, environments, and enimies. The game will be available for Xbox 360, PS3, and PC. April 2012 too long to wait? Well then you need to head to Gamescon 2011 Aug. 17-21st or PAX Prime Aug. 26-28th where they will be demoing the game. bl goty is awesome fun packed. 2012 is long way to go! “check me out, I’m dancing, I’m dancing” because this game was announced. The first had some issues but was a blast to play co-op even though someone on the team was a loot whore. Can’t wait for this.